Planos Holidays is a privately owned company with over 30 years experience in offering self catering villas and apartments on the island of Paxos. The company was originally founded by Gerry Copsey in 1984, who fell in love with the island’s charm during his holiday. Gerry returned to Paxos time and time again to discover more of the island and the more traditional side of Greece. During his time on the island he befriended local resident Pano, who he formed a partnership with. Together the pair worked on creating a small holiday programme of approximately 12 villas and apartments that would then allow others to experience the sights and sounds of Paxos. As the popularity of Gerry’s and Pano’s offering grew, so did the number of properties on offer. In 1994 Nick Harvey, also a regular visitor to the island, joined Gerry to assist running the Paxos operation. A busy 15 years later, Gerry handed the reigns over to Nick and offered him the opportunity to acquire the Planos brand name. The rest, as they say, is history. Today Nick, Pano and the team look after over 60 properties on the island, welcoming new and returning visitors year on year. Meet our dedicated and experienced team who are here to answer your questions and help you make your trip to Paxos a memorable one. Nick is the owner and Director of Planos Holidays and looks after the UK side of the operations. Nick has been running the Paxos programme for a many years, previously under former owner and co-founder Gerry Copsey. Nick took over the company in 2010 and now runs the business from his home in Devon. 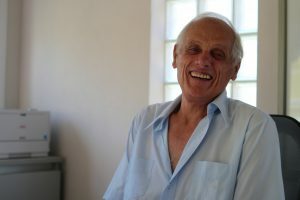 A true Paxiot at heart, Nick first visited Paxos in 1982 and immediately developed an affinity with the island and its people. Nearly 35 years later the same connection remains very strong, making Nick a true island expert. Mary first joined the company in 1997 whilst studying for a degree in tourism at the Swansea Institute of Tourism and Leisure. 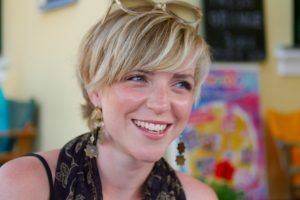 After graduating with a first class honours degree, she decided to stay with the company. She is now coming up to her 20th year as our Island Manager. 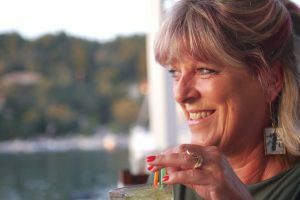 Mary is very much the face of Planos Holidays on Paxos and will be there to meet you on arrival and will wave you off on departure. In the meantime, she will maintain a discreet presence but will always be on hand to help. Pano is the founder of Planos Holidays and Head of Operations in Paxos. After starting a career in the travel industry an early age, Pano worked as an agent another UK tour operator. Seeing the potential within Paxos, He started a programme within Lakka in the late 1980`s, recruiting the Planos UK agents shortly after. Following many years of building a successful business, he passed ownership of the operation to us here in UK. 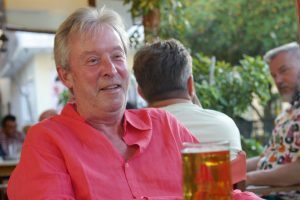 He is one of the most experienced figures within Paxos tourism and is highly respected within the community. We couldn’t ask for anyone better to represent us. Nikki is Nick`s wife, councillor and professional advisor in almost every aspect of life. A constant source of calm, she helps to keep Nick grounded and on the straight and narrow during the busy summer months. Nikki mainly takes a back seat within the business, but her artistic background has meant she has influenced many areas of the business with her creative abilities as well as her impeccable eye for detail. Another keen traveller, Nikki is never one to refuse a trip to Paxos! Tashi is Nick`s step-daughter and has been a regular visitor to the island since she was seven. She has been largely involved with the creation of our new website, and single-handedly re-photographed the whole programme for the launch of the re-designed site. One perk of being the boss’s daughter is the regular trips to Paxos, as well as the endless mojitos Nick often pledges in return for her photography skills. Tashi is off to Drama College in September 2016 but will be back in Paxos at the earliest opportunity. Dina is a long serving member of the Planos team and runs our office in Loggos. She has worked for Pano for over of 20 years, meaning there isn’t much she doesn’t know. Local to the village of Loggos herself, Dina is always a friendly face and a helpful guide to assist you during your holiday. She speaks fluent English but is always looking to improve her dialect by having conversations with our guests. Dimitris is Pano`s son and is responsible for the day to day running of our Paxos office. He can normally be found in our Lakka office accompanied by the family dog, Pongo. 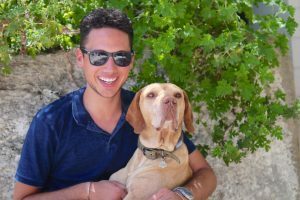 Dimitris studied tourism and languages in both England and Italy and subsequently joined the company full time in 2011. He speaks fluent English and Italian and is great at helping all our guests with any questions they may have throughout their stay.